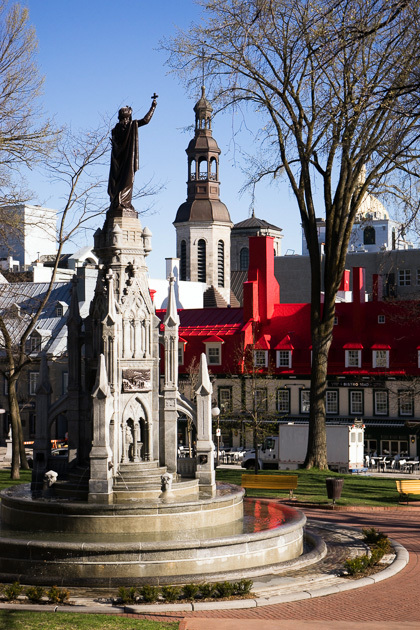 The most architecturally significant building in a city is rarely a hotel, but that’s the case in Quebec City. The Château Frontenac isn’t the tallest structure in town, but with its privileged position atop Cape Diamond, it’s certainly the one your eyes will be drawn to. Designed by American architect Bruce Price, this was the first of several chateau-style hotels built by Canadian Pacific, in a bid to promote luxury tourism along its lines. Naturally, we couldn’t resist going inside to check out the lobby, which was as luxurious as we’d suspected. I went to the concierge to ask about a brochure, and was surprised by the presence of a big dog lying next to the desk. Daphnie is the Frontenac’s “Canine Ambassador,” whose mission is to make guests feel more at home. Apparently, guests can borrow her for walks, should they be missing their dog while traveling. Even if you’re not staying at the Château Frontenac, you can still see much of the hotel as a visitor. From the lobby, go down a flight of stairs to find a photo exhibition about the chateau’s history, and make sure to check out the bar. 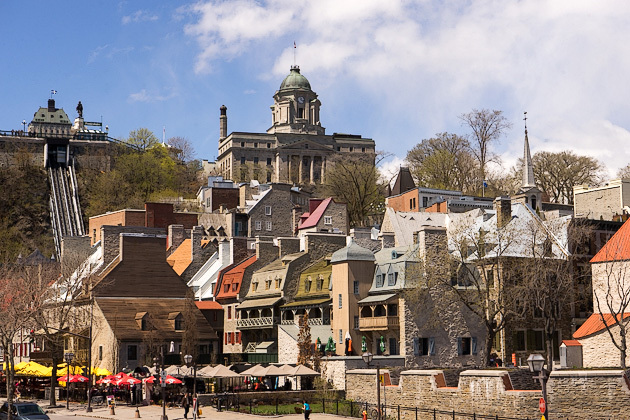 Whether or not you stayed there, the Château Frontenac will almost certainly be among your most prominent memories from Quebec City. Quebec City's Château Frontenac Built in 1893 by the Canadian Pacific railway company, the Château Frontenac dominates the skyline of Quebec City. A towering structure with over 600 rooms and an unforgettable profile that reigns over the walls of the Old Town, this is thought to be the world's most photographed hotel. I wouldn't doubt it. The Frontenac so large and central that it will be part of the backdrop in nearly every picture you'll take of Quebec City.